Birth of Jean-Baptiste Estienne, "the Father of French Tanks"
Born in the Meuse, Jean-Baptiste Eugène Estienne is considered the "Father of French Tanks" because of his role in designing and using this new weapon system during the First World War. A brilliant graduate of the École Polytechnique, Estienne joined the French Artillery Corps in 1883. He was passionate about innovation and his initial interest was in aviation and its possible applications for the army for combat and observation purposes. Deeply affected by the terrible loss of human lives at the beginning of the war, he played a decisive role in designing and developing tanks, whose potential he perceived very early on. Based on the inconclusive experience of the Schneider and Saint-Chamond tanks, he came up with a light, manoeuvrable armored vehicle requiring only two men inside. Having successfully overcome the reticence of his superiors, he worked with Louis Renault, who in record time perfected this new tank, familiarly known as the " Victory Tank". Book: Arlette Estienne Mondet, Le général J.B.E. Estienne "père des chars", published by Harmattan. 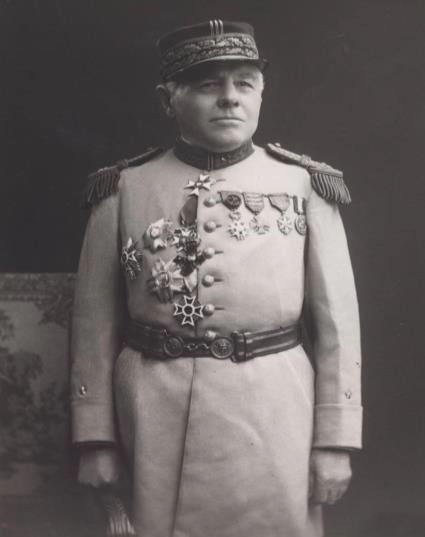 "General Estienne is known as the "father of tanks". He was the one who had these vehicles accepted, despite all obstacles, and developed them with Louis Renault. He was also a pioneer of military aviation. After the war, he was the man behind the long car rallies across the Sahara, in which Louis Renault and André Citroën competed with one another."